Except for his kunya (ابوالقاسم – Abu'l-Qāsim) and his laqab (فِردَوسی – Ferdowsī, meaning 'paradisic'), nothing is known with any certainty about his full name. From an early period on, he has been referred to by different additional names and titles, the most common one being حکیم / Ḥakīm ("philosopher"). Based on this, his full name is given in Persian sources as حکیم ابوالقاسم فردوسی توسی / Ḥakīm Abu'l-Qāsim Firdowsī Țusī. Due to the non-standardized transliteration from Persian into English, different spellings of his name are used in English works, including Firdawsi, Firdusi, Firdosi, Firdausi, etc. The Encyclopaedia of Islam uses the spelling Firdawsī, based on the standardized transliteration method of the German Oriental Society. The Encyclopædia Iranica, which uses a modified version of the same method (with a stronger emphasis on Persian intonations), gives the spelling Ferdowsī. In both cases, the -ow and -aw are to be pronounced as a diphthong ([aʊ̯]), reflecting the original Arabic and the early New Persian pronunciation of the name. The modern Tajik transliteration of his name in Cyrillic script is Ҳаким Абулқосим Фирдавсӣ Тӯсӣ. ^ "Search Results – Brill Reference". referenceworks.brillonline.com. Retrieved 5 January 2019. Abū l-Qāsim Firdawsī (329–411/940–1020) was a Persian poet, one of the greatest writers of epic and author of the Shāhnāma (“Book of kings”). ^ Kia, Mehrdad (27 June 2016). The Persian Empire: A Historical Encyclopedia [2 volumes]: A Historical Encyclopedia. ABC-CLIO. p. 160. ISBN 9781610693912. ^ Hamid Dabashi (2012). The World of Persian Literary Humanism. Harvard University Press. ^ a b c d e f g h Shahbazi, A. Shahpur (26 January 2012). "Ferdowsi". Encyclopædia Iranica. Retrieved 1 February 2016. ^ "Abu Mansur". Encyclopædia Iranica. ^ Shahbazi, A. Shahpur (26 January 2012). 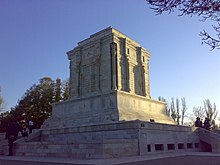 "Mausoleum". Encyclopædia Iranica. Retrieved 1 February 2016. ^ Donna Rosenberg (1997). Folklore, myths, and legends: a world perspective. McGraw-Hill Professional. pp. 99–101. ^ Shahbazi, A. Shahpur (26 January 2012). "Hajw-nāma". Encyclopædia Iranica. Retrieved 1 February 2016. ^ Cyrus Ghani, Sirus Ghani (2001). Iran and the rise of Reza Shah: from Qajar collapse to Pahlavi rule. I.B.Tauris. p. 400. ^ "Ferdowsi". Encyclopædia Britannica Online. 2007. Retrieved 4 June 2007.